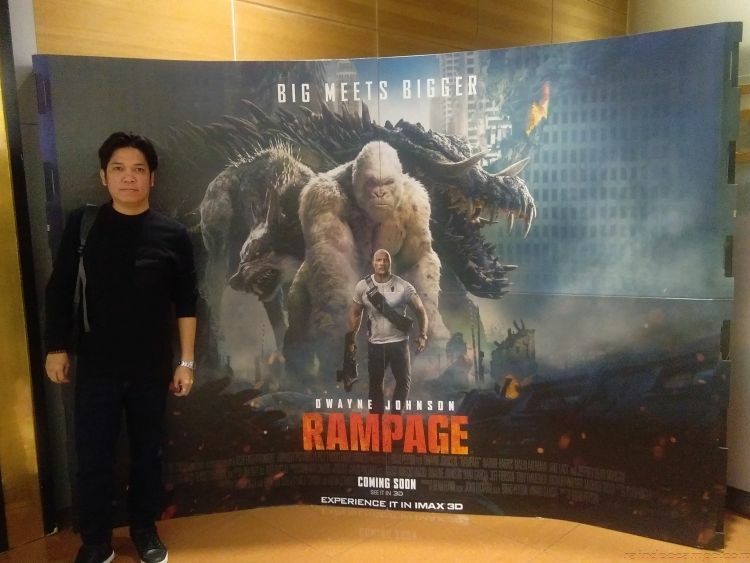 RAMPAGE brings fast-paced havoc to the big screen! Loosely based on a 1986 arcade game of the same name by Bally Midway, Rampage (the arcade) lets players choose three monster characters – George, Lizzie and Ralph as their game avatars and tries to survive an onslaught of military forces. Game sets and you win when an entire city is completely destroyed. RAMPAGE the movie is pretty much jut like the arcade game but with a back story and the “smoldering intensity” of the Dwayne Johnson aka The Rock. 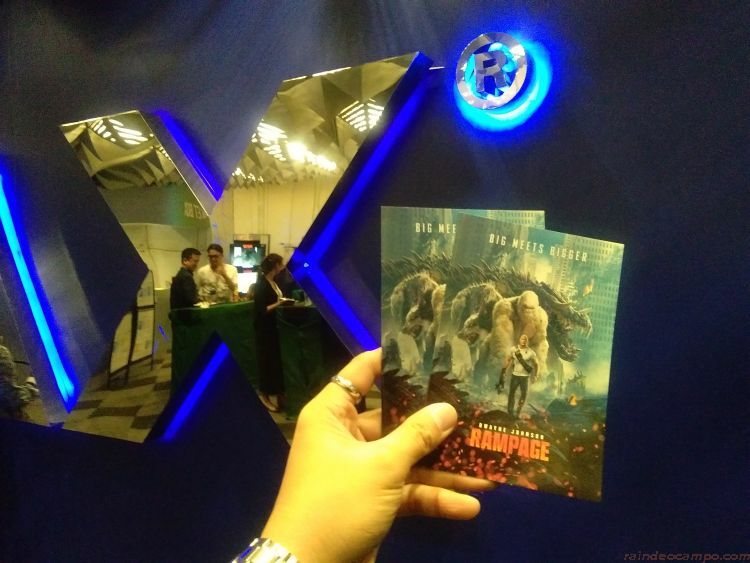 I’ve watched RAMPAGE on IMAX at the SM Megamall a day before its regular showing – the opening scene was pretty much intense and the action gets bigger and wilder towards the climactic “rampage” to the end. Dwayne plays the role of primatologist Davis Okoye who have grown pretty much attached to a very gentle (and sometimes naughty) albino gorilla called George whom he cared for since after he rescued the poor ape from poachers who butchered the rest of his family. George got infected with a genetically engineered pathogen, along with two other wild creatures during a freak accident, mutating the animals to gain enormous size and rage. The two other creatures was able to acquire some other abilities from their mutation, George on the other hand just got really huge. You know what comes next of course – military forces goes after the rampaging trio. For those who have a sick fantasy of seeing Chicago wasted, you’ll definitely get high on this movie. 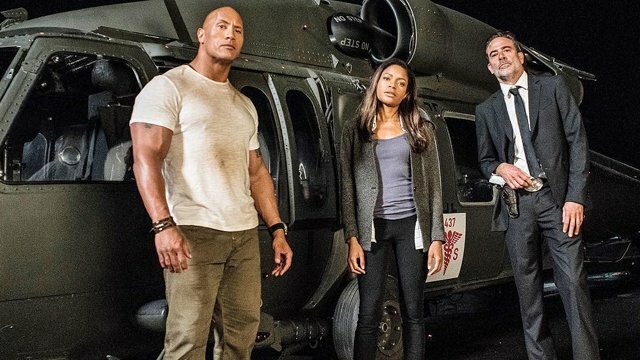 You’ll also get that feeling that this movie is like a cross between the films “San Andreas” (2015) and “Journey 2: The Mysterious Island” (2012) which both starred Dwayne Johnson – and why is that? Because RAMPAGE is directed by Brad Peyton who happens to be the filmmaker behind the other two movies that I’ve mentioned. Joining Dwayne in the film is Bond Girl Naomie Harris as genetic engineer Dr. Kate Caldwell. Aside from the latest bond films, you might have also seen Harris in Disney’s “Pirates of the Caribbean” franchise as Tia Dalma. RAMPAGE also reunites two of Zack Snyder’s “Watchmen” characters – Malin Akerman (Silk Spectre II) as Claire Wyden and Jeffrey Dean Morgan (Comedian) as Harvey Russell. Plus you’ll also see in Rampage, Joe Manganiello who will play the role of Slade Wilson aka Deathstroke in the upcoming Justice League sequel. While the story of Rampage was predictable the whole time, I must admit that the ending was unconventional – pretty clever. Big is Better with RAMPAGE! So I suggest you watch this on the expanded 1.9:1 aspect ratio screen and powerful audio of an IMAX theater to get yourself in on the action. RAMPAGE is now showing in SM Cinemas nationwide. Get your tickets via www.smcinema.com – download the SM Cinema app and get a chance to win tickets to advance movie screening.